As beautiful as our website is, sometimes the only way to really show off our favourite gadgets is to open the box and mess around with them. Today, we've been messing around with the Click Stick - it's a photo-taking device (compatible with iPhones and Android devices) that's specifically designed to take the best selfies ever! Here's our selfie stick, fresh out of its box. Notice the handy wrist strap, which is a very important feature if you're the kind of person who's constantly dropping things. This is where you put your phone when you want to take a selfie. The cradle is spring-loaded, which means that you don't have to fiddle around with screws or anything like that to get a secure grip on your smartphone. Once the phone is in the cradle, all you have to do is plug that cable into your headphone port. As you can see, this telescopic selfie stick has some serious extension! In the photo on the left, the Click Stick is fully retracted (about 20cm long). In the image on the right, we've extended it to its full length - roughly one metre! This means that you really can fit everybody in the photo; it's perfect for weddings, parties, and any other big 'group photo' occasion. The best thing about the Click Stick is its simplicity. You don't have to download any apps or change any settings - you literally just plug it in and start snapping away! Once the cable is connected to your headphone socket, you simply press the button on the handle to take a photo. No, we're not sure how it works either, but it's very cool! Here's the selfie that we took with the Click Stick (don't Andrew and Jon look amazed?!) We've just tweeted this picture using the hashtag #clickstick, and we encourage you to do the same once you've got a Click Stick of your own! Planes: Fire & Rescue - Out This Friday! What's that? You've already seen Planes? Oh, well, perhaps you'll be interested in its sequel, which is released in the UK this Friday! That is the Inflatable RC Dusty Crophopper toy, and it's available right here at Gadget Inspector! Dusty can perform 360o spins, steer in all directions, and inflate in seconds - he's the ultimate RC toy! So what are you waiting for? Order your Dusty Crophopper now and get ready for the family movie of the summer! The Rubik's Cube - an icon of the '80s, and the best-selling puzzle game of all time - celebrated its 40th birthday a few weeks ago. You may remember the interactive Google Doodle that was created to mark the occasion. Well, Cube fans now have a second reason to celebrate, and its name is the Rubik's Cube Light. This awesome item isn't just a cool, retro-themed lighting accessory; it's actually fully playable, allowing you twist, turn, and solve it just like any other Rubik's Cube! We think that the Cube Light would make a great gift for anyone (yourself included), but you'll have to be quick about buying one - we've only got a few left! 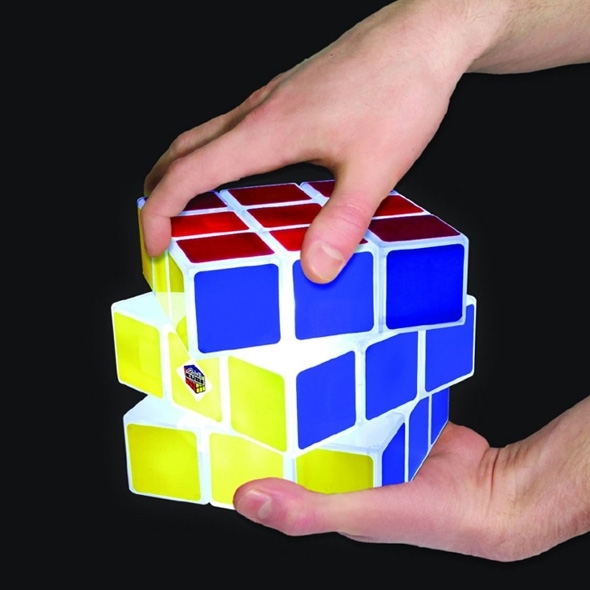 Click here to order your Rubik's Cube Light - just £29.99!